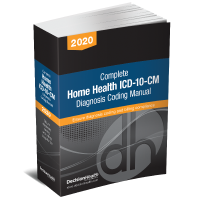 Give your billing and collections staff the information they need to bill correctly on the front end and correct denials before they reach auditors with Home Health Billing Answers, 2019. Prepare now for CMS’ new home health payment model – Patient-Driven Groupings Model (PDGM) set to take effect Jan. 1, 20120, or you risk your agency’s financial viability. Not only will you need to understand how to bill for payments in the new model, your agency will also need to spend money on training and billing department changes. 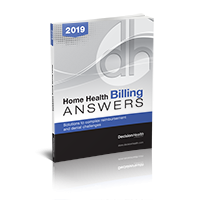 Home Health Billing Answers, 2019, walks you through every step of the billing process and provides crucial tips for avoiding common billing errors. Plus, it explains in plain-English, the confusing billing jargon and acronyms that can trip billers up. NEW! Walk through the new Patient-Driven Groupings Model (PDGM) to understand howyour current admission, coding, documentation and billing processes will have to change. NEW! Learn how to calculate your payment in the new PDGM payment system – will you be a winner or a loser? NEW! Walk through the 216 home health resource groups (HHRGs) in PDGM, which are far more than what currently exists under PPS (153). Learn to adopt audit processes to ensure that you are collecting the level of detail needed from physicians so that your clinicians and coders can choose the right codes. Get an update on new case-mix categories, codes and OASIS items, and learn how your revenue will be impacted. Claims submission: Get step-by-step instruction on how to complete accurate Medicare claims (with examples). Billing errors: Find out how to avoid the most common billing errors and how to read reject/reason codes. Also, use the included pre-billing checklist to reduce errors. Medicare claims: Receive an overview of non-covered services, claim types, HCPCS codes, revenue codes and how they are used. Financial outcomes: Billers get the basic guidance needed to minimize denials, PEPs, LUPAs and more. HIPPS vs. HHRG: Ensure you get proper payments by training your staff on the differences between HIPPS and HHRGS. Bonus: Tools and templates to ensure your agency gets the money it has earned – and fast! 100% Money-Back Guarantee: If you do not find that the Home Health Survey Trainer, 2019 helps you plan and implement effective agency procedures to prepare for state surveys and address deficiencies, return it within 30 days from receipt for a full refund, no questions asked.